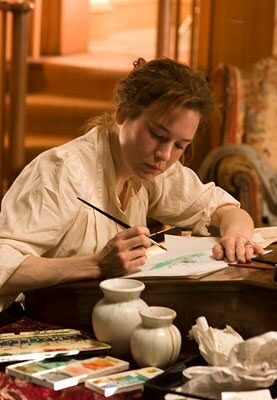 I just watched, again, one of my favorite movies, "Miss Potter" the story of Beatrix Potter played by Renee Zellweger. I love everything about it, from the clothes to the animation and of course the love story. I have always enjoyed her precious children's books. Every little creature she draws speaks volumes to me. I have had a fascination with mice since I was very small. This fascination has carried over into a small collection of mice. I even have tiny mice that roam in my dollhouse in my dining room. It's about this time of year when I daydream about putting a little play house in my back yard and planting a story book garden, one that Peter Rabbit would be happy to visit. I love this picture because of the sewing implements. This little mouse looks perplexed as he studies the patterns, I can relate to that more often than not. 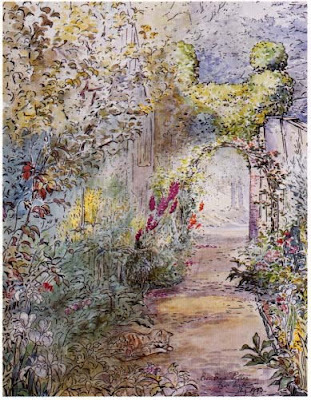 The colors of Beatrix Potter's illustrations are just dreamy. I have a feeling that it won't be long before the movie is back in my DVD player. Have a joyful day! 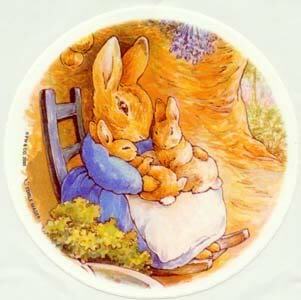 We love Beatrix Potter! I have not seen this movie. I am going to put it in my netflix queue. I love that last illustration. So sweet! Makes me think of snuggling my babies. 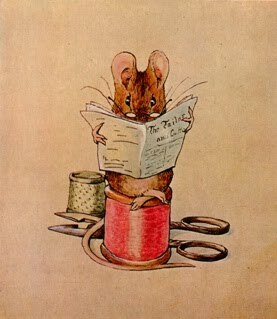 Love, love, love anything Beatrix Potter. Have picked up one of her books for the grandkids bookcase, but haven't introduced Natie to it yet. Hope she loves these books as much as my girls did when they were small. Oh how sweet those illustrations are. :o) My husband purchased a brooch for me that a woman made out of a Beatrix Potter plate, it is wrapped in sterling silver, and is of two rabbits dancing. It is my favorite! I LOVE Beatrix! Next time you are about to pop that movie in give me a call. I would love to join you. I haven't seen it yet. This is one of my faves too! 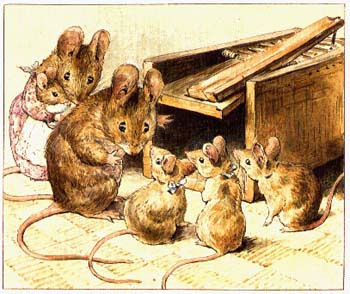 And I do like ILLUSTRATED mice...the real ones not so much.LOL! I did not know about this movie. I am going to look for it. I love Beatrix Potter, her stories and illustrations. Thanks, Renee. I think I must have seen this movie 3 times or more. I love it more than ever each time I see it! Thank you for the reminder. I have collected B.P. books for several years at sales I go to and then I cut them up and decoupaged them on a big storage box. It turned out so cute. I love Beatrix & her sweet stories & incredible illustrations. . . & the movie. . . oh my! I'm with you - I love everything about it. Sigh. Thanks for posting about her. . . what a fun moment! I loved that movie too! I alway like nice feel good shows! I haven't seen that one yet, I feel a girls movie night coming this way. Thanks so much for your sweet comments on my quilt! Do you have any suggestions for my next one? I just love Beatrix too and read all of her little storybooks to my children when they were tots. I also love this movie. I think I'll put it on my Netflix (again). 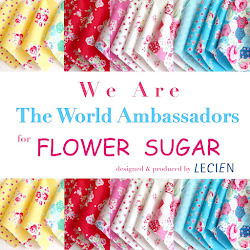 Hello Renne, thank you so much for visiting my blog. I too love the movie and anything to do with Beatrix Potter. Your blog is lovely. Oh looks like a cute movie and I just ordered it from my library...I love little mice things too.